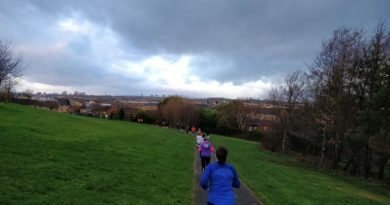 Drumchapel parkrun : Down, Up, Up, Repeat. We’ve been North, South and East so it must be time to hit the west. 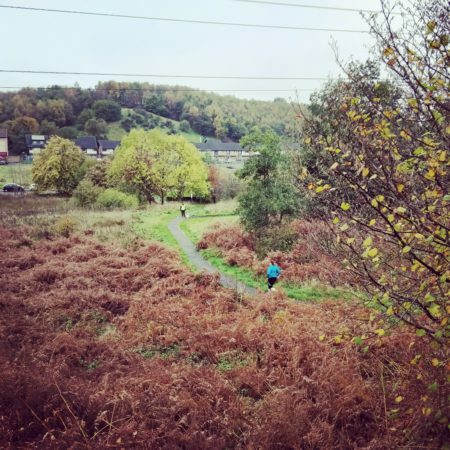 After jaunts to Fort William, Aviemore and Lochore Meadows we took a big step into the unknown with a trip over to the badlands (well, the west coast) to tick off the Drumchapel Parkrun from our list. Now never having been there we really had no idea of what the place would be like. Hey, a parkrun is a parkrun and if we want them all we’re going to visit lots of places we’ve never been before. That’s kind of the point !! The parkrun takes place in Garscadden Wood, a forestry commission park with housing on one side and a golf course on the other. 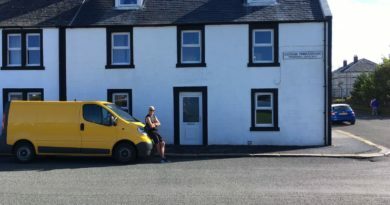 We knew we were in the right place when we came across the usual strange coven of brightly coloured parkrunners getting the race briefing from event director Brian. There were 46 of us this time around. Yay, a top 50 finish !!! It was at this point that my GinRunning colleague found out the secret I’d been hiding. The event briefing mentioned that we were brave. How come, you ask? Well we were taking on the Drumchapel parkrun. Not a fan of hills, is our Bex. I knew I’d pay later for not telling her “that” small detail. The marshals reckoned I owed her an afternoon tea. 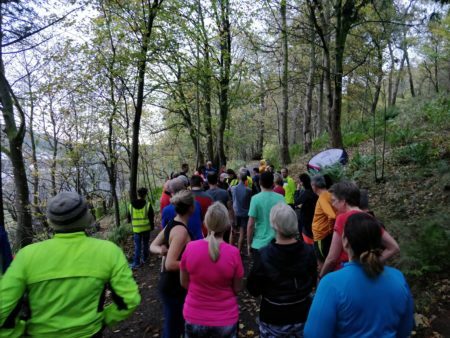 Yep, Scotland’s hilliest parkrun, and the 4th hilliest in the UK. This was going to be fun. As it was put “You’re not going to be getting a P.B. here”. The first couple of hundred meters is fairly flat, then the sting in the tail of “hilly” hits you. 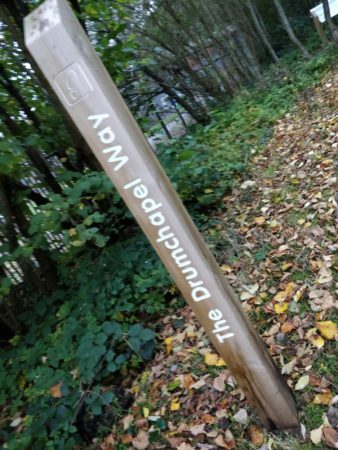 What goes up must come down, but at Drumchapel you get all the “down” in one big, steep lump. After that it’s a climb all the way back round to the top go the hill where..
You get to do it all again. The 5K includes three spins round this loop, with the big downhill over too soon for you to catch your breath before you’re off on the way up again. A couple of the sections are quite steep too, just to make sure you get the ‘Scotland’s hilliest” message. The park itself is beautiful. The paths are mostly tarmac and you get some cracking views from the top of the hill, right across the houses to the hills in the distance. The marshals were, as always for parkrun, brilliant encouraging the runners on at every junction. And making sure we all did the three loops of the course and weren’t tempted to “accidentally” head for the finish after two. It has to be said, the Drumchapel parkrun is a bit of a gem. A green oasis not far from the sprawling metropolis we can’t recommend it highly enough. Unfortunately as we had an appointment at the nearby Golden Jubilee Hospital we couldn’t hang around for the post run coffee, but I have a feeling we’ll be back. Once we’ve completed the 40-0dd Scottish parkruns obviously. 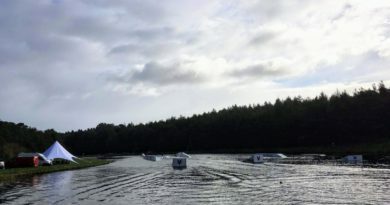 ← Aviemore Half Marathon 2018 Review : The one with THE puddle. Foxy Trail Run at Foxlake. Sun, Sea, Sand and Llamas.